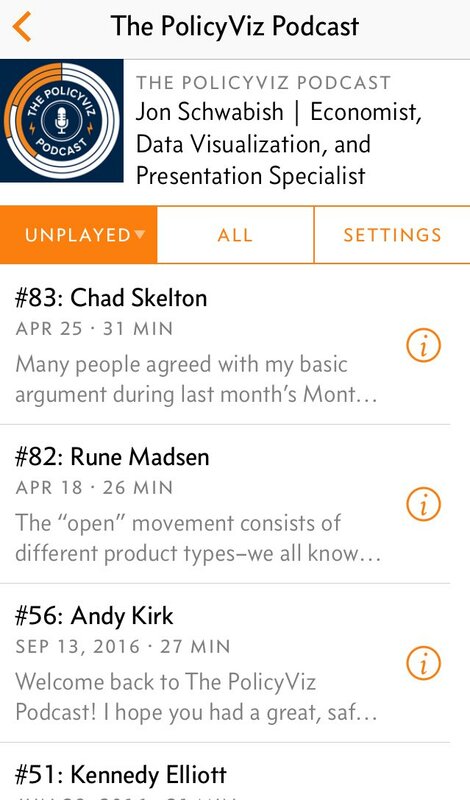 Chad Skelton: I'm on the PolicyViz podcast this week! I'm on the PolicyViz podcast this week! The PolicyViz podcast, hosted by Jon Schwabish, is one of my favourite podcasts: illuminating 30-minute conversations with various people in the data visualization field. So it was a particular thrill went I loaded it up in Overcast this morning and saw my own name in the episode list. Jon and I had a great chat about teaching data visualization and data storytelling. You can find the episode in your favourite podcast app or right here. Also, at the risk of logrolling, I highly recommend you make the PolicyViz podcast part of your regular podcast lineup. Jon's a great interviewer and the episodes are always concise and focused. If this data visualization thing doesn't work out, Jon could switch careers and go into radio.